Preheat oven to 350° F. Grease a large fluted tube cake pan with cooking spray. Put half of biscuits (1.5 cans) into pan. Add half of the following ingredients: brown sugar, cinnamon, pecans. Pour in half of the melted margarine. Add remaining brown sugar, pecans, cinnamon and margarine. Cover with aluminum foil and bake for 40 minutes. Take off the foil and bake for 20 additional minutes to finish the bread and give it a crunchy topping! Ah…the joy of Christmas morning. I can just see it now…the pitter patter of little feet coming down the stairs, waking up mom and dad at the crack of dawn to see what Santa brought. It’s a magical time, isn’t it? But, magical or not – the fam’s gotta eat! Between shopping, baking and holiday prep it’s safe to say you might be too exhausted to whip up a big holiday breakfast. 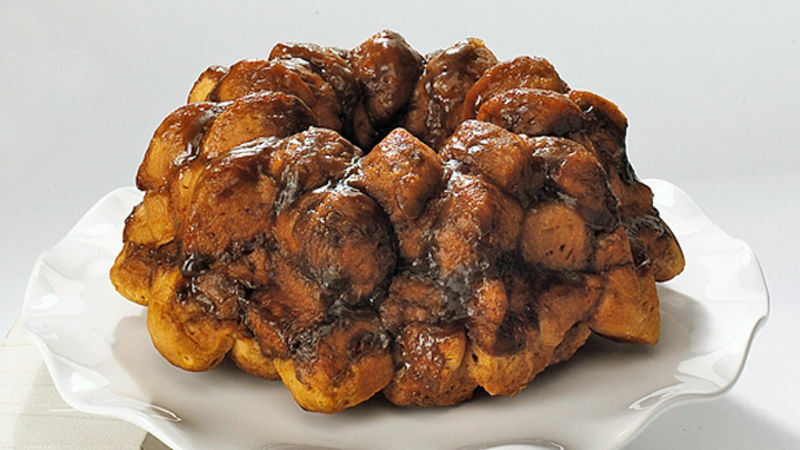 If you’re losing a little bit of your Santa steam, try this make-ahead monkey bread that will power you through all that Christmas morning excitement!